I would just like to thank all the members, and the few non-members who came out for the first breakfast seminar of 2018. Also a big thank you to Daniel Martin of Microsoft who presented on MS Teams, and a new way of collaborating. 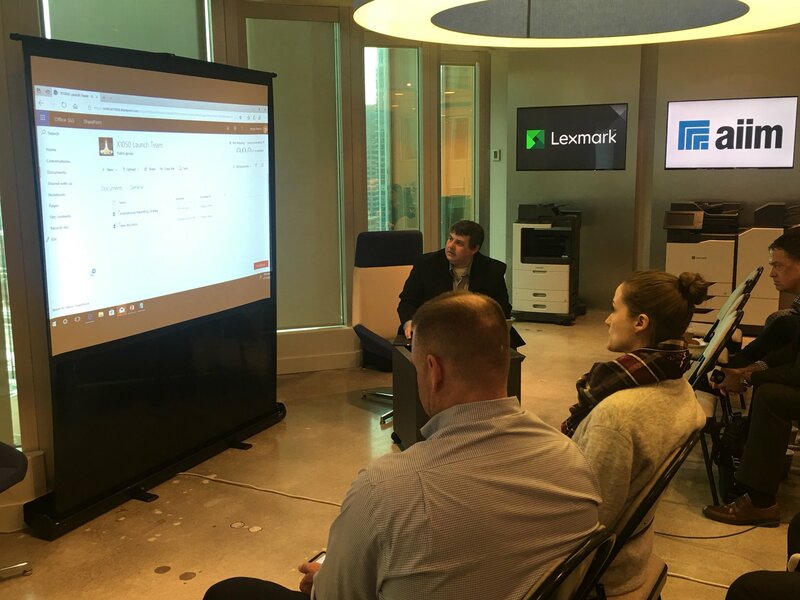 Thanks to Wendy Tryhorn of Lexmark, who hosted our meeting in their swanky downtown core meeting space. The audience were fantastic this morning, and we had some great discussion about how MS Teams fits in, or does not, with the way organizations manager their information; how Teams works with Planner, with existing SharePoint sites, and how Office365 Groups work as the under pinning layer. The audience members requested a follow up session on how Microsoft's "protective layer" works - so expect a future session covering Information Rights Management (IRM), Data Loss Prevention (DLP) and Records Management functionality - you asked, so we will organize it ! Daniel from Microsoft works his demo magic ! I would like to know if there are any chapter meetings/gatherings in Ottawa? As a federal employee it is very difficult to obtain approval to travel for membership participation, and I would like to meet up with and have an opportunity to discuss issues face to face with other AIIM members. I am based in Ottawa. I have been a member of the chapter for a few years now. Is the chapter able to provide list of members in the Ottawa so that we can meet up and network? Thanks in advance your help. Hi Amitabh - I am not sure why I never received a notification of your message until today, literally months later ! I would not be able to provide you with a list of members in Ottawa, because I don't think the AIIM system allows me to pull a report based on city, plus I am pretty sure it's not allowable under data protection rules. You could if still interested send me a message with your contact details,and I could send a message out to the membership, and they could then contact you directly. I live in Toronto and just recently joined AIIM. Are there plans for a next meeting? Welcome to AIIM and to the First Canadian Chapter. We have no meetings for 2019 planned yet. We are discussing and anlyzing the result of a survey of our membership we ran last year, to figure out the best way of meeting members needs. This includes deciding on whether to do both "in face" meetings, and virtual ones (Webex type) for all the members who do not live in Toronto. Yes, oddly enough, Canada doesn't end at the periphery of the GTA . 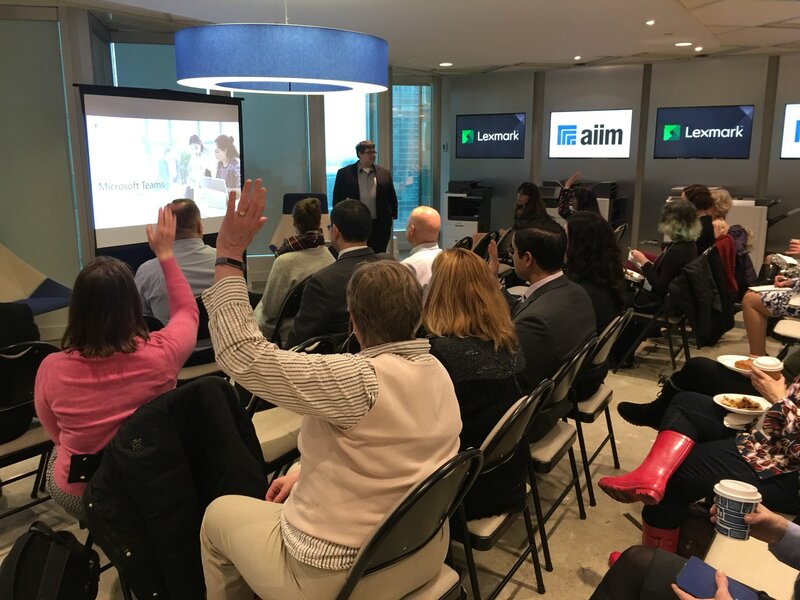 Do you know if AIIM has any plans to expand the chapters in Canada, especially in Ontario? It is great that we have a Toronto Chapter however I am in south Halton, and there are alot of folks out here that may want to setup a chapter, as traffic to get to Toronto for the am, day or early evening meetings is nearly impossible without taking a vacation day. Hopefully one day I will make it out to an event. 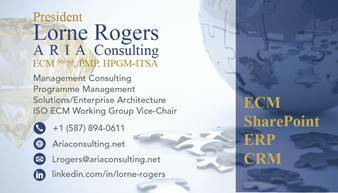 AIIM as an organization does not setup chapters per se, it is down to the membership. The "Toronto" chapter by default became more of an Ontario chapter, but there would be nothing at all to stop yourself and a group of like minded people from setting up your own chapter. If you don't want to go the whole hog, a lot of US Chapters use MeetUp.com for "sub-chapter" or local gatherings. The best part about that is you don't need to go through any of the machinations to setup an official chapter. I hope rhat that all makes sense?